Boynton is looking to add depth and talent by way of the transfer market. I wrote a post a couple of weeks ago about two potential transfers Oklahoma State should be targeting for the 2019 recruiting cycle. One of these two prospects, Sean McNeil, has since narrowed down his list of possible landing spots, and the Cowboys didn’t make the cut. However, there has been a lot of recent news about Mike Boynton reaching out to several other players who are on the transfer market, and it seems like he really wants to add a guy with college level experience to the roster. I wanted to take a look at these players in more detail and rank them based on which ones are the most talented, while also taking into account current position needs for the Pokes. I’ll start with my lowest ranked player and work my way down the list to No. 1. McNeill announced on March 23 that he would be transferring from Cal. In his two seasons with the Golden Bears, he averaged 32.7 minutes per contest while recording 11.2 points, 2.2 rebounds, 1.5 assists and 1.3 steals per game. In addition, the 206th-ranked prospect nationally coming out of high school, shot 38.6 percent from the field, 35.1 percent from 3 and 72.0 percent from the charity stripe. McNeill is a left-handed combo guard who is extremely athletic. He can create for himself, but also does a nice job facilitating and getting his teammates open looks at the basket. The Houston native has a nice mid-range game and is a knock down shooter off the dribble. He uses his speed and quickness to excel on both ends of the floor and thrives in transition, as shown below. McNeill has been inconsistent as a shooter throughout his college career, but when he gets going, he can really fill it up from beyond the arc. The reason I have McNeill ranked the lowest on my list is that it’s looking like he would have to sit out next season and then only have two years of eligibility remaining. This is the least remaining eligibility of anyone on this list who has to sit out a year. Along with OSU, McNeill is also being recruited by Cincinnati, Nevada, Northwestern, Pittsburgh, TCU and SMU, among others. He also recently scheduled visits to TCU and SMU. The Arkansas guard announced last Thursday that he would be entering his name in the NCAA Transfer Portal. Shortly after this news, Hogville.net‘s Kevin McPherson reported that the former 139th ranked player nationally had been contacted by Oklahoma State, along with Butler, Colorado State, TCU, Virginia Tech and UTSA. Embrey-Simpson was offered by Oklahoma State before committing to Arkansas in September 2017, so coach Boynton is familiar with the Oklahoma City native. He averaged 4.1 points, 1.2 rebounds and 0.6 assists in 14.6 minutes per game last season for the Razorbacks and shot 27.1 percent from beyond the arc. The young guard was very inconsistent as a scorer last season for Mike Anderson and staff and had questionable shot selection at times. However, he did find some success as a shooter several times throughout the season and put up four double-digit scoring performances, including the game against LSU shown in the following video. Embrey-Simpson also moves really well off the ball. In addition, one of his best attributes is his ability as a defender, he was able to force opponents into turnovers and played very aggressively on that end of the floor. I give the slight edge to Embrey-Simpson over McNeill, as I think Embrey-Simpson was the more talented player coming out of high school and has a higher ceiling, along with having one more year of eligibility. And due to the coaching change and Embrey-Simpson being an Oklahoma native, he may be able to obtain a waiver from the NCAA and be able to suit up for the Pokes next December. The Daytona State big man picked up an offer from the Cowboys in early February. He averaged 11.0 points, 7.4 rebounds, 2.3 assists and 1.0 steals per game in just over 22.4 minutes this past season. Gueye shot 38.2 percent from 3-point range and 59.3 percent from the free throw line. I broke down Gueye in detail here, so I won’t dive into this again here, but his versatility and size make him a guy that could contribute right away from the Cowboys next season. Gueye is being recruited hard by East Carolina, and picked up offers from Arkansas and Texas Tech in late 2018, but I think the Cowboys have a good shot at landing him. Tucker began his career with Florida Gulf Coast before transferring to Arkansas-Little Rock. Over those three seasons he averaged 11.0 points, 4.1 rebounds and 1.2 assists in 24.2 minutes per game. He really blossomed into a scoring threat this past season with the Trojans averaging 20.3 points per game while shooting 49.1 percent from the floor, including 41.1 percent from 3-point range. Tucker is extremely athletic and does a good job of getting into the lane and finishing… sometimes with highlight reel dunks like the one shown below. Now, I realize the Sun Belt isn’t the Big 12, but I think the North Carolina product would be a nice addition to this Cowboy roster. Being a grad transfer, he can play right away and he has three years of college level experience. His ability to fill it up from long-range and the energy he brings to both ends of the floor would be huge for this OSU squad next season. Even if he doesn’t end up with a starting role, he would be big time spark off the bench. Tucker is also being recruited by Gonzaga, Michigan, NC State, Oregon and Tennessee, along with multiple other schools. He recently received a call from UNC head man Roy Williams, and being a North Carolina native, this may end up being the landing spot for the talented Little Rock guard. Lewis is another former Oklahoma State target, and in my opinion, the most talented player with the highest ceiling on this list. 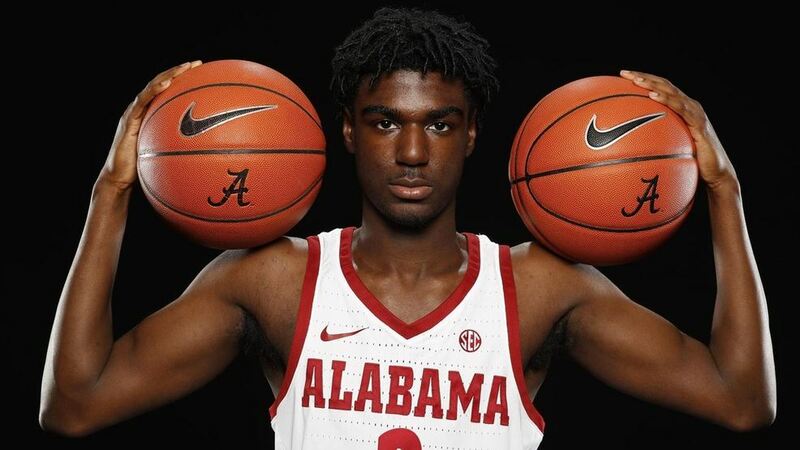 During his freshman year at Alabama, he averaged 31.6 minutes per contest, and tallied 13.5 points, 2.9 assists and 2.2 rebounds per game. Additionally, he shot 43.1 percent from the field, 35.8 percent from 3-point range and 78.3 percent from the free throw line. His play garnered him a spot on the 2019 SEC All-Freshman team, and he did all this as the second-youngest player in D-I at 17 years old. Lewis was the 39th ranked player in the nation coming out of high school, and he showed why he was rated so highly during his first season of college play. Lewis is a very gifted ball handler and loves to attack the basket of the dribble. The Alabama native has great balance and body control finishing inside, but also can light it up from distance if given space, or if he creates space on his own, as shown below. He could still use some additional muscle on his 167-pound frame, and you would like to see him continue to improve as a shooter, but overall his speed and ability on the offensive end gives him the potential to be an elite player at the D-I level. Lewis would have to sit out next season, but would have three years of eligibility remaining. There’s a long list of schools already after Lewis, such as Arizona, Auburn, Duke, Georgia, Iowa State, Nevada, Miami, Ole Miss, TCU and Tennessee, to name a few. I don’t think the Pokes have a high likelihood of landing the talented young guard, but if they did, he would be one of the most skilled players on the Cowboy roster.